U.S. employers posted an annual rate of 6.08 million job openings in August, down from the record 6.14 million in July, the Bureau of Labor Statistics said. 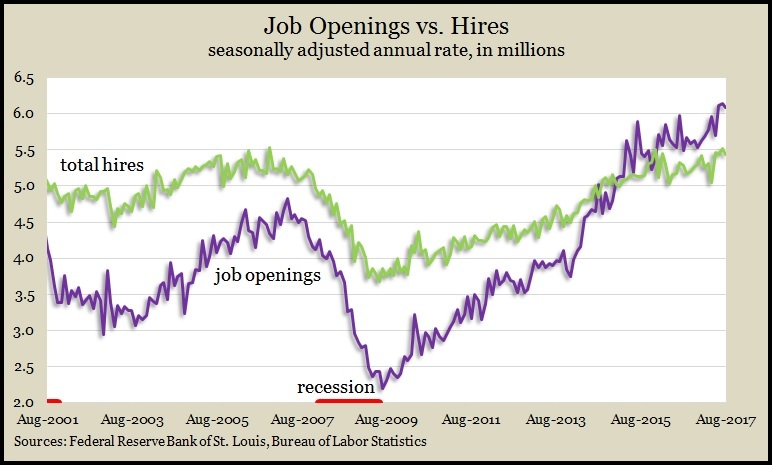 At the same time, hiring dropped to 5.4 million from July’s 5.5 million, which also was the highest in 17 years of data. Openings have mostly outrun hires since 2015, suggesting mismatches between demand and supply, which could raise wage pressure. Rising wages help drive consumer spending, which accounts for about 70% of the country’s gross domestic product. In a sign that the Gulf Coast hurricanes have upset energy prices, wholesale inflation rose at a 2.6% annual pace in September, the highest rate since February 2012, according to the Bureau of Labor Statistics. Excluding the volatile costs of energy and food, the core rate for the Producer Price Index rose 2.2% from September 2016, up from a 2% year-to-year in August. Further excluding trade services put wholesale inflation at a more moderate 2.1% pace. The moving four-week average for initial unemployment claims fell for the second week in a row, dropping 7.2% after a 16% rise following the hurricanes that hit the Gulf Coast and Puerto Rico. Data from the Labor Department show new jobless applications are 28% below the 50-year average. Claims have been below average every week since the beginning of 2013, signaling employers’ longstanding reluctance to let workers go. The broadest measure of inflation, the Consumer Price Index, rose 0.5% in September, the fastest clip in eight month, though much of it was a 13.6% rise in gas prices following the Gulf Coast hurricanes. Excluding energy and food prices, the CPI grew just 0.1%. Year-to-year, the index rose 2.2% for its third consecutive increase, according to the Bureau of Labor Statistics. Core inflation, though, rose 1.7%, where it has been stuck for five months in a row, still below the Federal Reserve Board’s target of 2% inflation. 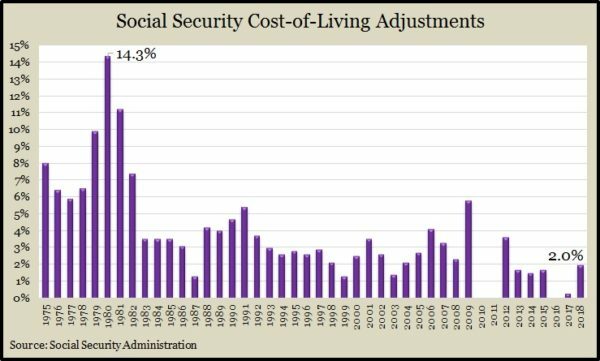 The Social Security Administration announced that its annual cost-of-living adjustment will increase 2% in 2018, the biggest raise since 2012. The government uses the Consumer Price Index to help determine how much – or whether – to raise benefits each year. The adjustment affects more than 61 beneficiaries beginning in January. The University of Michigan said its preliminary consumer sentiment reading for October reached its highest level since early 2004. Attitudes toward both current conditions and expectations improved from the end of September. An economist with the survey said consumers appear to be reaching an “as good as it gets” mode in which they expect the economy to keep expanding but only at a moderate rate. A key indicator of consumer spending, retail sales, rose 1.6% in September, although the Commerce Department report reflected elements of recovery from the hurricanes. For instance, auto dealerships had higher sales as Gulf Coast residents replaced vehicles, gas station sales rose with higher prices and home building centers supplied demand for repair materials. Eight of 13 retail categories reported higher sales. Since September 2016, total retail sales rose 4.4%, slightly above the 50-year average. In a separate report, Commerce said business inventories rose 0.7%, the same increase that sales experienced in August. The inventories-to-sales ratio, which measures how well companies are keeping up with – but not ahead of – customer demand, was unchanged, though relatively high compared to the historical average.